Warm up the chili on the stove or in the microwave. Now it's time assemble your Haystack into layers. 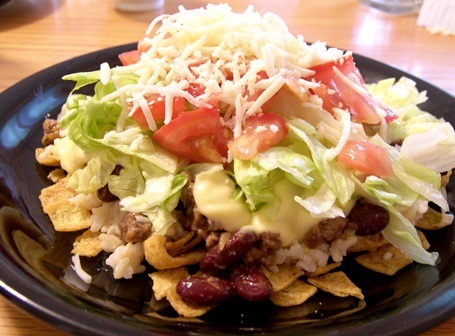 First you take a hand full of tortilla chips and crunch them up on your plate. Then add chili beans on top of the chips. Top with veggies one layer at a time. Then for a finishing touch top with salsa and sour cream as desired. When its all made on your plate it will look like a haystack!